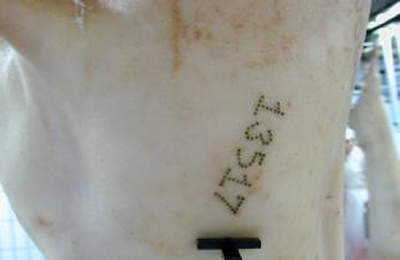 A ham tattoo which is a fail safe in addition to the smart card tracking system for carcasses. On 21 March 2009, Meadowbrook Farms filed for bankruptcy. Meadowbrook Farms (formerly known as American Heritage Farms) was a cooperative of over 100 pork producers in Illinois. In 2004 the company finished the construction and commissioning of its first pork processing plant. The construction work was started in 2002 and was mechanically completed in early 2004; commissioning occurred during the first half of 2004 and it finally came on-stream in mid 2004. The 120,000ft² plant was capable of processing 150 million pounds of pork per year, which corresponds to around 3,600 hogs per day. The idea behind starting such a plant originated from a concept by CEO James Burke and a founder member of the cooperative, Amy Heberer Bouvet, in 2001. They questioned the high losses that local pork producers were making per carcass when processed by national meat processing companies (a clear case of the high value of the end product not being passed onto the producer). The plan for a state-of-the-art, low volume organic and speciality pork processing facility was the result, following the formation and support from the American Premium Foods cooperative. The construction and outfitting of the new facility required an estimated investment of $33m and provided 215 jobs to the area. The then 200 pork producers of the cooperative contributed $13m, while $19.7m was provided by bank loans from Stearns Bank of Illinois and guaranteed by the US Department of Agriculture (USDA); some of this was used to buy the 42-acre site in Rantoul. USDA also provided a $500,000 grant to help in the development of the plant’s tracking system. The State of Illinois provided a grant of $1.7m to equip the plant and the City of Rantoul provided a tax incentive scheme, aided land purchase and also capped the facilities water and sewer rates for the first five years, providing a flat rate for 35 years after that. On 21 March 2009, Meadowbrook Farms filed for bankruptcy in the US Bankruptcy Court for the Southern District of Illinois. Operations at the plant had been discontinued in 2007 due to lack of funding for operations and mismanagement. The withdrawal of a major contract by one of its customers, Triad Foods Group, was also a reason for the closure. The plant was shut down in January 2009 and around 600 employees were laid off. The 90,000ft² facility was constructed on a 42-acre greenfield site in Rantoul chosen from 20 other sites in the area due to tax incentives and existing infrastructure; 17 acres of the site has been reserved for future expansion. University Construction of Champaign was awarded the contract to widen US route 136 and make other improvements to the road infrastructure (a contract worth $3.1m) so that the plant would have the required road access for transport of hogs and finished products. The plant was designed and constructed by AMTEK of Kentucky. AMTEK provided all the architectural design services for the plant and carried out the general construction. The plant design also included a pre-treatment wastewater facility that was outfitted by StorkAqua Industrial Water Treatment (contract worth $826,700); the total for building and outfitting the wastewater pre-treatment plant was $1.7m. The wastewater treatment facilities also include an ex-US Air Force plant that used to serve the nearby military base and can handle five times the capacity required by the pork processing plant. The plant’s internal equipment and systems were designed and installed by The Facility Group of Atlanta. 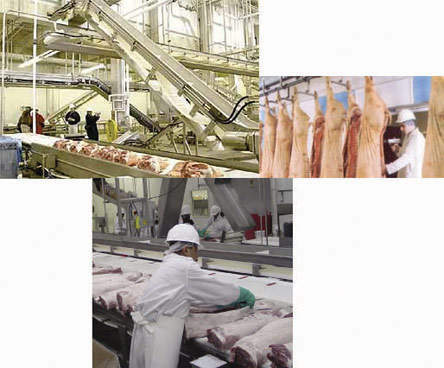 This covered all areas for slaughtering pigs, including lairage systems, automated slaughter-line kill floor robotics, carcass evaluation (incorporating neural network technology as part of the control system), two dressing lines with automation, cutting and deboning units, chill tunnels and chill rooms, weighing, logistics and packaging system, specialised machinery (sausage meat production and ham production), production tracking management systems including veterinary control and carcass tracking systems and a complete state-of-the-art process control unit. Some of the equipment for the slaughter line including loin pullers was GE LeBlanc equipment. The tracking system incorporated electronic tag smart cards placed on each meathook. The electronic tags contained information about what farm the hog came from, how it was raised, what it was fed and what medications it received. Data was collected on each carcass and included live and cut weight, fat-to-lean ratio, and yield. All of this information was available to the hog farmer to improve their hog raising practices. The IT equipment running the plant’s systems was supplied and installed by CSB International. SFK Technology provided 16 transducers for the plant which send ultrasonic signals so that fat to lean ratio can be measured. A specialised humane stunner system was used that controled the amount of voltage being applied to each animal at slaughter (animals are transferred to the plant and then rested for two hours prior to slaughter). Grandin Livestock handling systems (Temple Grandin) was involved in the design of the livestock unloading and holding areas; these areas were designed to minimise stress to the animals and used a system where hogs entered the lairage area three abreast instead of being forced single file through a shute. The Meadowbrook facility was one of the few in the US to have adopted a condensation scalding process into their carcass preparation. The process was incorporated instead of scald tubs to loosen the hair prior to carcass cutting. The process involved passing carcasses through a tunnel, which was steam heated to 150°F. The process is preferred by the USDA as it is much more hygienic. The scalding tunnel system was supplied by MPS Stork. The plant worked on a two-shift system processing some 26,000 hogs per week (400 head of animals per hour). The facility was owned by the 200 members of the cooperative from Illinois, Iowa, Indiana and Wisconsin who could buy shares in the plant for $900 each. Each share entitled the member to have 50 animals slaughtered and processed per year. Members range from 200 to 50,000 head sold annually. Once producers had committed to the project, they had an obligation to bring a certain number of hogs to the plant. 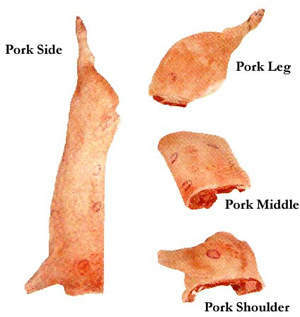 Members also maintained the co-op’s carcass composition and pork quality standards, including minimal pale soft exudative pork and be Pork Quality Assurance Level III certified. A screening process, designed to randomly sample co-op member hogs for quality, had been ongoing since early 2004 and consulting veterinarians examined herds to ensure animals meet health certification standards for some niche markets (organic, antibiotic-free, trichinae-free and products for ethnic communities). The rendering products from the plant were produced at a specialist contract facility from animal carcass material transported from the plant. The plant contributed 0.8% of total US pork production, but mainly in the speciality products market. Only Trucker Quality Assurance (TQA) programme graduates could transport the hogs. Producers were paid on the value of primal cuts.